Rhinegeist is the second largest craft brewery in Ohio, behind Great Lakes Brewery in Cleveland, and they’ve now been named the 33rd largest craft brewery in the country. The National Center for the Middle Market had the opportunity to speak with the Director of Culture, Dennis Kramer-Wine, to learn how this startup brewery has grown to producing 100,000 barrels in 2017 alone. Rhinegeist is the second largest craft brewery in Ohio, behind Great Lakes Brewery in Cleveland, and they’ve now been named the 33rd largest craft brewery in the country. They produced 100,000 barrels in 2017 and continue to expand to places where they identify opportunities to win. 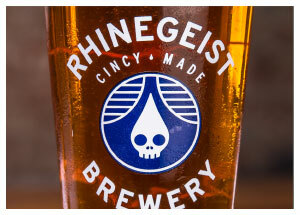 Rhinegeist translates to “Ghost of the Rhine,” and refers to the brewery’s mission to resurrect the spirit and brewing heritage of the Cincinnati’s Over-the-Rhine neighb orhood. Rhinegeist resides in the original Christian Moerlein Brewing Company’s bottling plant that dates back to the pre-prohibition era. Over The Rhine, deemed the “Napa Valley” of beer pre-prohibition, was once home to over thirty breweries. Rhinegeist was founded by Bob Bonder and Bryant Goulding, who met as consultants in California, searching for a more fulfilling pursuit that they themselves could build and enjoy. The two men researched business opportunities across the United States and identified Cincinnati as an approachable city with a low cost of doing business. Bob moved out first to start a coffee roasting company called Tazza Mia. At the time, Bob lived above a bar and noticed the lack of local, Cincinnati beer. This insight and Bob’s discovery of what is now Rhinegeist Brewery, was enough to convince Bryant to join, and the two started the brewery shortly thereafter. Bob, who could be described as a “serial entrepreneur” who is creative and learns markets, together with Bryant, who worked for multiple California breweries, have years of experience developing smart strategies and staying ahead of the curve. They have significantly different skill-sets, which contributed to their initial, and now ongoing, successes. As a startup brewery, Rhinegeist prioritizes product quality, brand development, operations and culture. In addition, they constantly monitor new research and trends in the space. These focus areas allow them to grow quickly and to build momentum, such as opening a taproom that has become a Cincinnati icon for community gatherings. They currently compete against thirty-five Cincinnati breweries, with seventeen more in the works. A calculated approach to brewery growth and expansion has helped them build a clear competitive advantage within an ever-crowded and fast-growing craft brewery industry. Bob and Bryant’s first order of business was product development, so they hired Jim Matt, formerly a biochemist from Eli Lilly. Jim emerges as one of their secret weapons - he can formulate any recipe based on flavor and he understands how sugars break down and the ingredients interact. Jim’s creativity and fundamental understanding of ingredient interactions and flavor development has led to the creation of high-quality and extremely popular beers like Truth and Peach Dodo. Visually, Rhinegeist describes its brand as bright and vibrant with clean colors and prominent lines. The design creates a feeling of approachability and conveys the message that it is affordable and appeals to a wide range of people. In grocery stores, the company always places new products next to their well-established ones in order to maintain a consistent and familiar brand experience. Unlike many craft breweries, Rhinegeist is responsible for their own distribution. This provides flexibility and allows for them to develop crucial relationships within the network. According to the company, it is a “headache we were willing to work with.” In addition, Rhinegeist bought their own screen-printing equipment in order to allocate previously outsourced resources to reinvest in people and infrastructure. Dennis Kramer-Wine, Director of Culture, describes Rhinegeist as “the most special place to work, ever…[Rhinegeist is] incredibly special and community-oriented.” Bob and Bryant’s ambitions to build a purposeful business within the Cincinnati community extends beyond the world class beer. Employees find the work meaningful and feel they are contributing to a beer culture. The community and innovative values that drive Rhinegeist are on full display in the company’s taproom, also known as a “giant playground.” Cincinnati embraced the public space immediately and frequent it often. The taproom also serves as a test kitchen for new products. Rhinegeist generally introduces products in the taproom and utilizes sales data to determine what to bring to scale. Rhinegeist is a true visionary in the craft brewery space. The company closely monitors the current trends through research, podcasts, interviews and insider material in order to build the future of craft breweries and remain dominant in the space. Post-production, Rhinegeist tracks all of their beers against what is currently trending. A few years ago, Rhinegeist created Bubbles by adding cranberry juice and peach nectar to one of their ciders. The concept was proposed as a way to infuse a rosé bent into their already popular cider. Fast-forward to today, and the brand has become the number two brand in their portfolio. Rhinegeist refers to the product as a “crazy disruptor” since it caters to beer, wine and cider drinkers. The company literally created a new category that did not exist before - rosé ale. Rhinegeist’s success stems from their confidence to take calculated risks and make smart decisions. Bob and Bryant strive for change and evolution, two notions that the company embraces. The founders remain the unequivocal leaders of the company with their strategic decision-making and ability to continually capitalize on their momentum. The ability to diversify their portfolio without overextension derives from their priorities and clear focus: product quality, brand development, self-distribution, and the culture they have created with their employees and in the community taproom. This winning combination, along with ongoing innovations like Bubbles, continues to strengthen Rhinegeist’s position as an innovative craft brewery leading the charge in Cincinnati.